Hurricane Irma visited Florida forcing a mandatory evacuation in our area of Northeast Florida. We traveled to Pine Mountain, Georgia to ride out the storm. When we returned home, thankfully to an intact house, I downloaded the pictures from our trip. I discovered the picture below that my daughter had taken on one of our afternoon hikes. I packed one suitcase with essentials to evacuate, my Bear Strength Hoodie was in my suitcase. I began to reflect on my own personal journey with Bear Strength Clothing Company. My journey started in 2014. I spotted Sam Heughan, who plays Jamie Fraser on Outlander on the Starz network, wearing the Fear The Beard T Shirt in his Twitter avatar. The message of strength resonated with me immediately as I had been praying for strength at the time. Graham McTavish, Dougal MacKenzie on Outlander, rocks a Fear The Beard T Shirt as well. Falling in love with the clothes was inevitable after I placed my first order. My respect for the company, founded by two brothers from Wales, increased when I read about the company’s charity collaborations. I reached out to The Bear Cave and asked if they would like to contribute to Cooklander To the Stove, a cookbook created by fans and friends of the show Outlander. 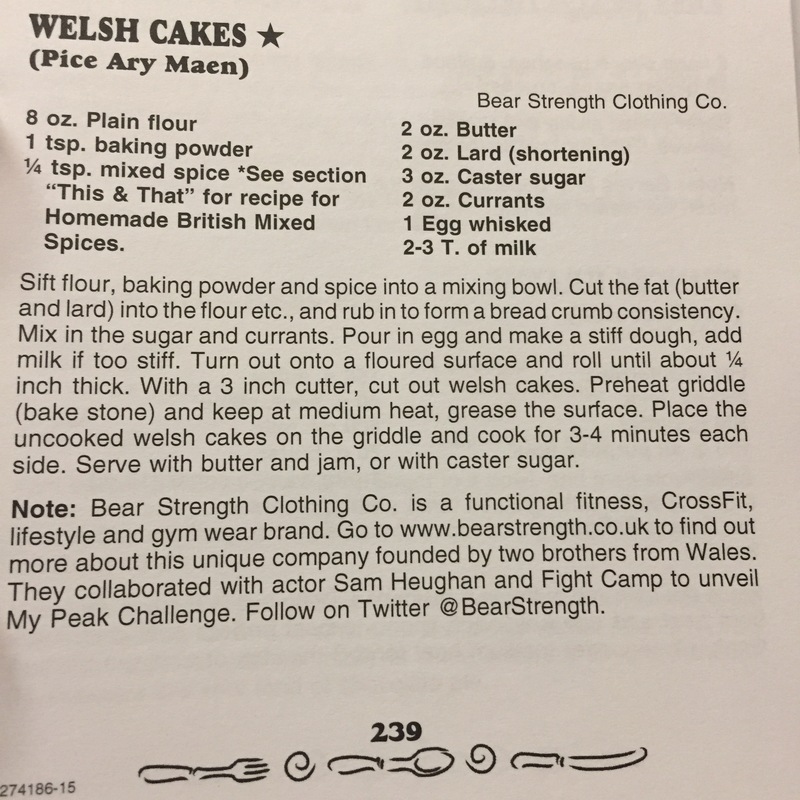 Their Welsh Cakes can be found on page 239 of this amazing cookbook, not only do the bears know about functional fitness, but they cook too! Smart bears! The proceeds from sales of the book benefit Bloodwise UK, World Child Cancer, and NPH USA. You can still get your paws on a copy at www.cooklander.com. 2016 proved to be an action packed year along my journey. In January 2016, I joined the 13 week challenge at Titan up Fitness in Jacksonville Beach, FL. My trainer’s nickname for me was “Bear Strength” because I always had something from their line for my workouts: leggings, T Shirts, sports bra, not pictured. I swear I had better workout days when I wore their clothing. April was a challenging month. My father had emergency surgery to remove a brain tumor. Floridians do need sweatshirts and jackets. Most buildings are so well air-conditioned, you bring something to wear inside. I spent many hours at Mayo Clinic in Jacksonville. If you guessed that I took my Bear Strength Hoodie, you would be correct. My dad is such a tremendous example of strength. The picture below was taken a month after his surgery. He was doing PT five days a week at 76 years old. Naturally, he needed more gear. I ordered this Tri Blend T Shirt for him. I’ll admit, from April 2016 to the present, life has been rough, both of my parents have had a difficult time health wise. I wanted to help take care of them, but I forgot about myself. My workouts have not been consistent, I haven’t blogged as much as I have in the past. However, I got back on program August 1, 2017. I’ve started walking on the beach again and working out at home. I gave up Coca Cola and started eating healthier. I started making time for me again, and I feel better. My parents have good days and bad days. As of now, dad is cancer free. Yea!!! I came to the conclusion that if I want to be ready to take care of them on the stressful days, I need to be healthy too. Obviously, I need new workout clothes. I checked out Bear Strength’s new range at http://www.bearstrength.co.uk?rfsn=729098.f1414. I would be happy with any item, but some of my favorites are below. If you would like to find out more about the founders of the company, please read this wonderful blog which appears in ThePeakPosse Post, and I reblogged on my site, https://inspiredbyoutlander.com/2016/02/12/meet-bear-strength-the-gents-behind-the-growl/. Thank you so much for taking the time to read about my journey! I’m so proud of the fact that almost three years after I started blogging, Bear Strength Clothing Company is still one of the most popular search terms on my blog. Don’t forget to follow all things #TeamBearStrength on Twitter @BearStrength and on Instagram @bearstrengthclothing.